Preheat the oven to 350 degrees F. (For cakes) Butter two 9-inch x 2-inch round cake pans. Line with parchment paper, then butter and flour the pans. (For cupcakes) Line 24 to 30 muffin tins with cupcake liners. Sift all the dry ingredients (the first 7 listed) into the bowl of an electric mixer fitted with a paddle attachment and mix on low speed until combined (if you don’t have a stand mixer, do this process by hand – a hand mixer gets to0 messy). In another bowl (preferably with a spout, like a large wet measure) combine the water, oil, eggs, and vanilla. With the mixer on low speed, add the wet ingredients in three batches, scraping down the edges after each addition. With mixer still on low, add the coffee and stir just to combine, remembering to scrape to the very bottom of the bowl with a rubber spatula. (For cakes) Pour the batter into the prepared pans and bake for 35 to 40 minutes, until a cake tester inserted in the center comes out clean. 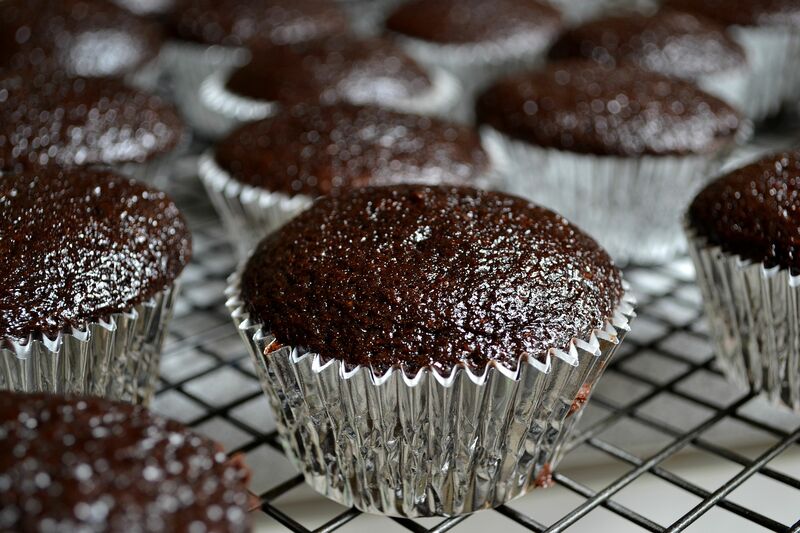 (For cupcakes) Evenly spoon the batter into the individual cupcake liners, adding or subtracting liners as needed, and bake for 20 to 25 minutes, until a cake tester comes out clean when inserted in the center. Cool in the pans for 30 minutes, then remove and transfer to a cooling rack to cool completely. Read more about this recipe and my musical pairing by clicking HERE.